(C) This is a concept design study of a self propelled 155 mm howitzer that provides a measure of nuclear protection to the two man crew. 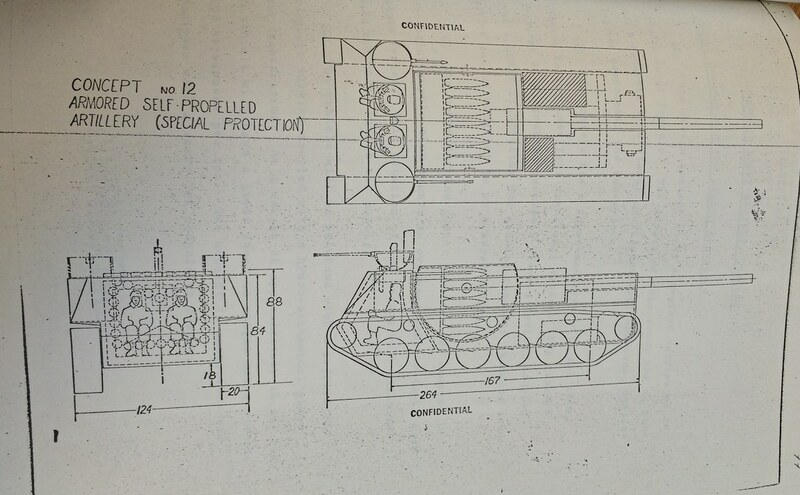 The intent of this study was to explore the design problems and operational constraints involved in providing nuclear protection for the crew in this type of vehicle. (C) The weapon is somewhat similar to the concept previously described. However, in this study it was envisioned that liquid propellant could be developed. This would simplify the propellant zoning problem. It was further envisioned that a universal fuse could be developed. The projectiles are automatically loaded from an endless conveyor. At a point in the line with the breech, the belt is lowered for loading alignment, and then raised to provide recoil clearance. (C) In this concept we have not provided independent weapon traverse. This weapon is laid in azimuth by the vehicle steering system. A small auxiliary turbine provides the power for this operation. Eliminating independent weapon traverse was an exploratory design effort. 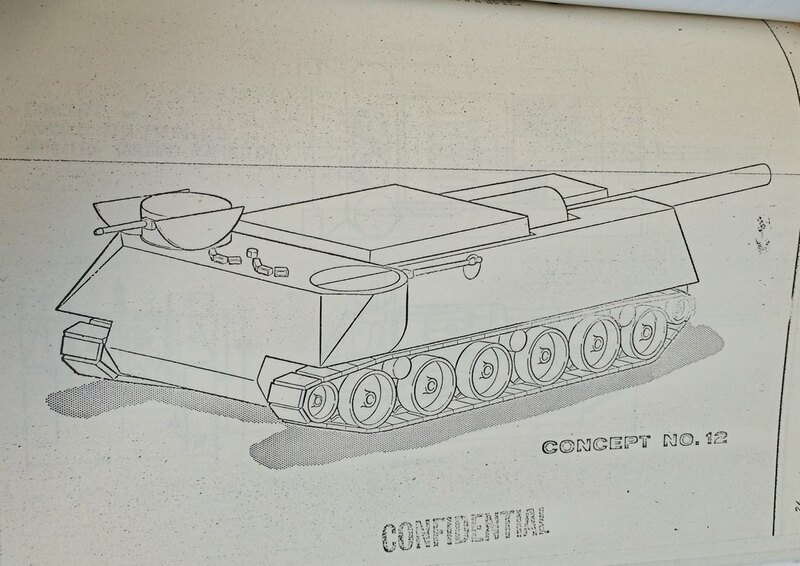 It was believed that this would simplify the design, and it would improve vehicle firing stability because the firing force is always throughout the longitudinal axis of the vehicle. The suspension system will also permit lowering the vehicle to improve pitch stability during firing. (C) The vehicle is equipped with two remotely operated weapons. One for a small machine gun, the other for the Vehicle Rapid Fire Weapons System. (C) Fire control could be similar to that described in the previous concept, except that no link would be required for an azimuth, since the weapons on vehicles are permanently coupled. h. Primary armament: 155 mm Howitzer. i. Nuclear protection is provided for the two-man crew. j. Two remotely operated auxiliary weapons small machine gun and vehicle rapid fire weapons system. Drawing from 11 concept, please correct this. Hi, I really love this series of postings and your site generally. Do you have an undistorted scan of the general arrangement drawing of the vehicle? It would be useful for modeling in CAD and 3D printing a model.